Amid an increased federal emphasis on health care policy during the early 1990s, many state governments launched initiatives aimed at identifying better ways to promote access to health care. Then-Gov. Zell Miller formed the Governor’s Commission on Health Care to advise on health care reform in the state. 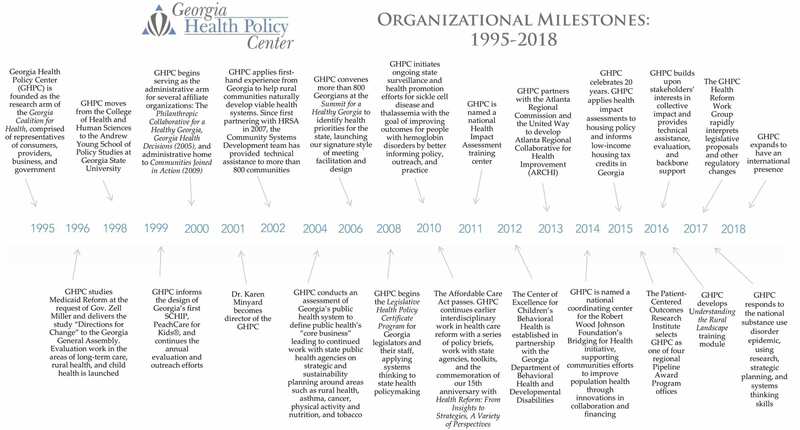 In 1995, the work of the commission transitioned to the newly established Georgia Health Policy Center (GHPC). GHPC, then housed in the College of Health and Human Services at Georgia State University, served as the research arm of the Georgia Coalition for Health, which represented consumers, providers, businesses, and government. Former Commissioner of the Georgia Department of Human Resources Jim Ledbetter served as GHPC’s first director. In 1998, the Georgia Coalition for Health faded out of the spotlight, but GHPC remained active and found a home in the newly formed Andrew Young School of Policy Studies at Georgia State University. The center remains active in health system transformation. GHPC’s initial areas of work — long-term care, rural health systems, and child health and well-being — developed out of the early Medicaid reform work with the state. From those initial areas, GHPC’s portfolio grew to also include projects in the areas of behavioral health, community health systems development, financing health, health in all policies, and population health. Relying on a three-pronged approach of evaluating, translating, and implementing research, policy, and programs, GHPC draws on its cumulative learning from working with public and private organizations at the national, state, and local levels to continue to positively impact health at the community level.